Adolphus Hailstork (b.1941) holds a doctorate in composition from Michigan State University. Additional studies were taken at the American Institute at Fontainebleau with Nadia Boulanger. His compositions include works for chorus, solo voice, piano, organ, various chamber ensembles, band, and orchestra. He has also written a work for trombone and piano, John Henry’s Big (Man vs. Machine), published by Presser. His music has had significant performances by major soloists, chamber ensembles, and orchestras including the Chicago Symphony, New York Philharmonic, and the Philadelphia Orchestra. 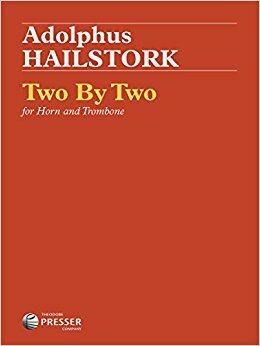 He is currently Professor of Music and Eminent Scholar at Old Dominion University in Norfolk, VA.
Two By Two was composed for Marlene and Bob Ford, hornist and trombonist of the East Virginia Brass and fellow faculty members at Old Dominion University. The first of two movements open with the gestures of a baroque era French overture: majestic with dotted rhythms immediately followed by a quick tempo romp for the rest of the movement, featuring many off-beat accentuations. The second movement also begins with the French overture rhythms and then accelerates into a fast Spirito tempo. This is interrupted by a lyrical Adagio section, which again leads to a fast tempo, concluding with Adagio, ending in C-major. The duet is formally, melodically, rhythmically, and harmonically quite conservative. Technically it is within the grasp of good, undergraduate level performers but musically interesting enough for professionals. The paper quality and printing are first class.